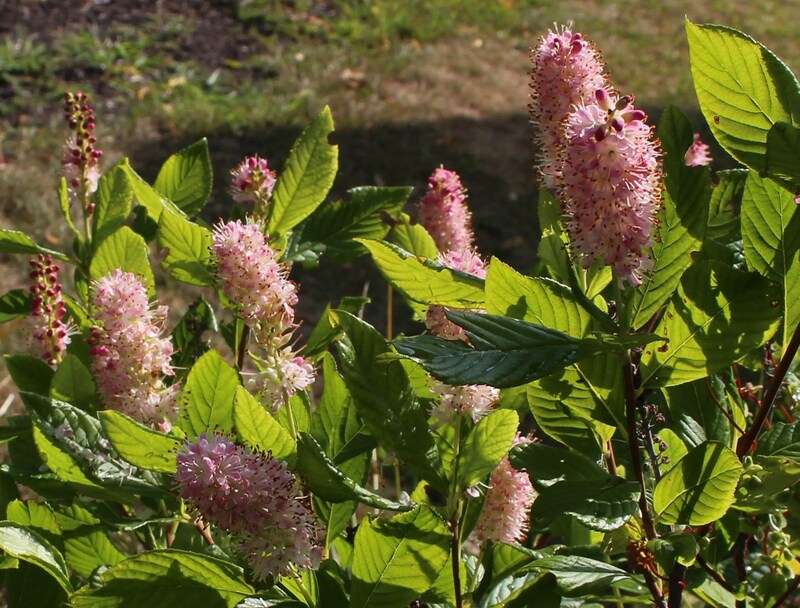 This entry was posted in fragrant plants, native plants, shrubs and tagged Clethra alnifolia "pink spires", fragrant plants, native plants, shrubs for wet areas. I love the fragrance of Oriental lilies outside. Someone picked a stem from the old house and brought it home. In the house it’s a bit much, especially when you’re eating. ha, your right. I like the smell of lilies in passing but a closed in room with that scent would be too much for me too. Come to think of it there are a few flowers where a little goes a long way! I have a clethra alnifolia by the front door also, but it struggles in our alkaline soil. Occasionally I think of replacing it but never do. The scent it gives off is pretty mild. For myself, I am not into subtlety when it comes to color or fragrance (as long as it is sweet). Between you and me I think most clethras look like they’re struggling a little. The only time I ever see them look completely happy is streamside. Lilies , jasmine or hyacinths in the house are all too strong. 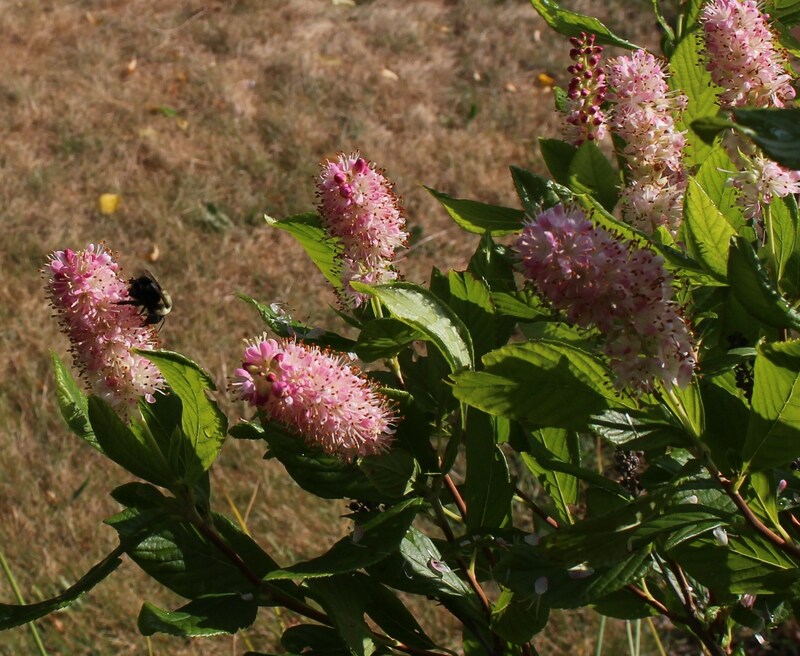 I hadn’ t noticed that Clethra has a smell. I must go and sniff it. You have time to nap on your porch? Do you really? Or do you just close your eyes and plan what you are going to plant, or move next? Chloris are you proud of me? I made a literary reference… probably my first and last, and no mulberry was mentioned… but I tried! I agree all of those are too much in the house, some lilies even need to be further back in the yard…. somewhere out near the fritillaria imperialis. The porch has already been the site of several naps and near naps…. It’s a common mistake to underestimate my capacity for laziness. I am very impressed with your reference to A Midsummer Night’ s Dream, Frank. Even though it is August. Drat. The noise you hear is my ego deflating….. I better enjoy my summertime naps while I still can! Buddleia is a little sickly sweet, isn’t it. I can’t seem to smell it as well as some of the other scents, so can at least ignore it a bit. Funny how some people are more or less sensitive to certain fragrances. Heliotrope is supposed to be wonderful, but I can’t ever get even the faintest waft off a bloom. There a a few blooms I cannot tolerate for too strong a fragrance. I cannot drive home with marigolds or petunias in the car. Many lilies and hyacinths, and even lilacs can annoy the heck out of me if planted near an entry, so I get what your family member has said. That’s my wife completely! The only scents she seems to enjoy are rosemary and garlic, all the others you’ve mentioned drive her back indoors. I’m worried that some spring soon she will finally discover the lilacs I planted along the back fence. Lots of perfumes can be too strong; some of my lilies are lovely out side but smell like a Baroque church inside, almost sickly. Trachelospermum is strong even in the garden but ok if it isn’t too close you where you’re sitting, and even the wisteria can be overpowering if you sit under it for very long, but that said, I love perfumed plants! I never even thought of wisteria, I supposed it’s not easy to cut so never really ends up in the house, but yours is close enough and it is a huge planting! I also like perfumed plants, but really love the perfumed foliage plants such as rosemary and lemon verbena. You can always turn up the fragrance on these by brushing against them…. otherwise they sit there inoffensively. That’s a good point about the foliage, I. Love all the Mediterranean plants for that reason. I sometimes think I prefer the white one! I guess it always depends on what you have and what you think would be better. I’m surprised this one has held on as long as it has, the downspout really helps it pull through dry spells. I wonder if I would plant it again in a new garden. The bees love it but the bloom season is relatively short. Good thing it has nice autumn color! My datura that blooms at night is very heavy and I can only take it for so long. The dill in the garden however I don’t tire of it at all. I have fennel all over and that’s one scent which wears out its welcome with me fairly quickly. Datura would be a nice one to add, it’s amazing how a flower can be so fragrant yet be so stinky when the leaves are damaged! With me it is Hyacinths in the house, just too strong altogether! I much prefer the perfumed flowers outside where the perfume can come gently on the breeze. Yes! I prefer fragrance outdoor too. Some scent coming in through an open window is pleasant, but a pot of hyacinths on the table is way too much. Outdoors, something about the sunshine and breeze and the surprise of smelling a new scent adds a lot too. I actually don’t know the fragrance of Clethra. Will have to hunt for some at the botanical garden.